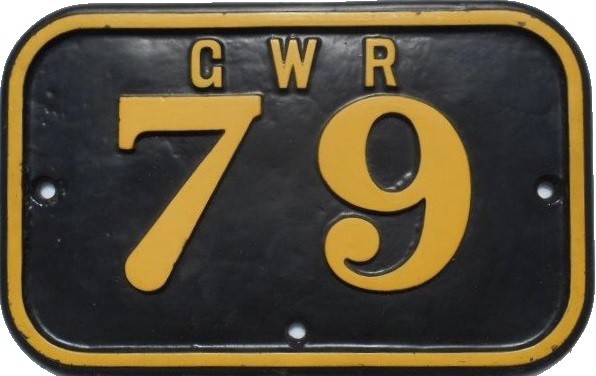 Lot 33 A C/I CABSIDE NUMBERPLATE "GWR 79" as carried by ex-Rhymney Railway 0-6-2T No. 36 built in August 1921. Absorbed into GWR stock on 1st January 1923 and renumbered accordingly. For many years a resident at Cardiff Docks, Caerphilly, Dowlais and Rhymney. In 1954 it was moved from Radyr to Swindon Works and was cut up in 1955. Restored front, back in ex-loco condition. Rare and very difficult to obtain an example with the letters GWR and only two-figure numbers. Supplied with Bill Peto's very detailed historical data.